Speak to a Scopione Specialist over the phone or email. Manage account settings, payments and order info. Learn about placing, tracking, managing your orders and more. 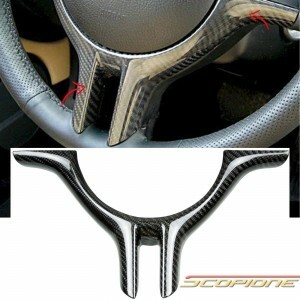 This Scopione carbon fiber split spoke steering wheel half cover is designed to enhance your vehicle's performance and appearance, with a true unique carbon fiber design.The Scopione split spoke steering wheel cover is made from Scopione lab grade 2x2 3K twill weave Carbon-fiber, contains high strength-to-weight ratio. They come with a glossy clear coat for UV protection and shine, keeping your investment looking brand new from the elements. This Scopione steering wheel cover is made to mask the inner bottom portion of your split spoke steering wheel. Modification is not needed. Professional Installation advised. Secured in place with included double sided tape 3M tape. Note: If for any reason you decide over time that you want to remove this item, the process can be reversed. Note: If for any reason you decide over time that you want to remove/change this item, the process can be reversed. Do you create customized automotive and motorcycle parts? Do you sponsor? If so, how do I qualify? Can I pick up the item locally? How do I check the status of my order with ScopioneUSA.com? How long does it take for you to process and ship an order? My order was damaged during shipping, what can I do? What is “Grade A” carbon fibre and carbon fiber? Are Scopione products made with 100% carbon fiber materials? How can I judge the quality of carbon fiber products in general? 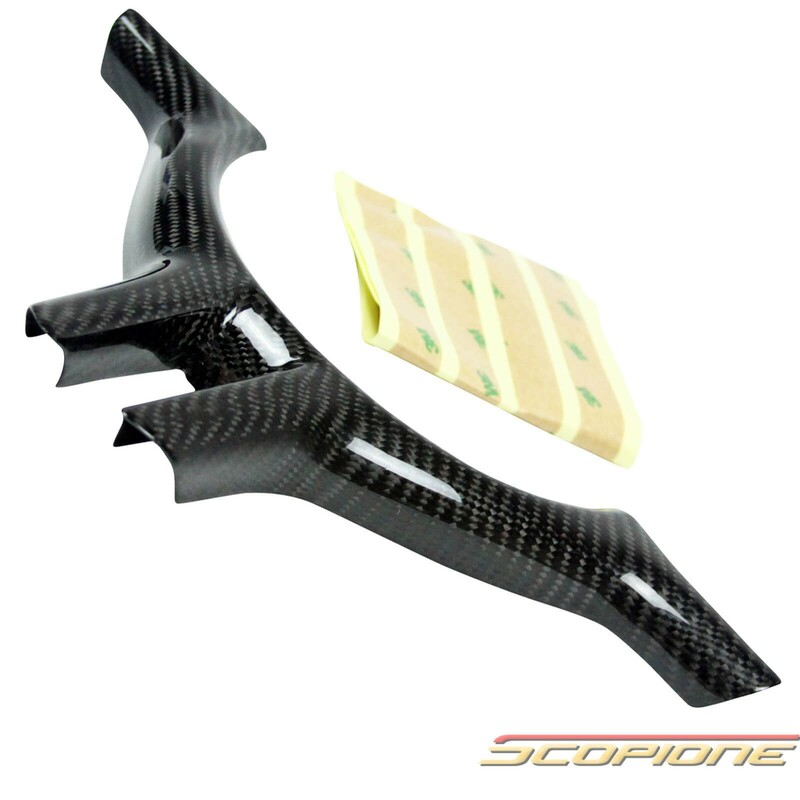 Why should I use carbon fiber parts? 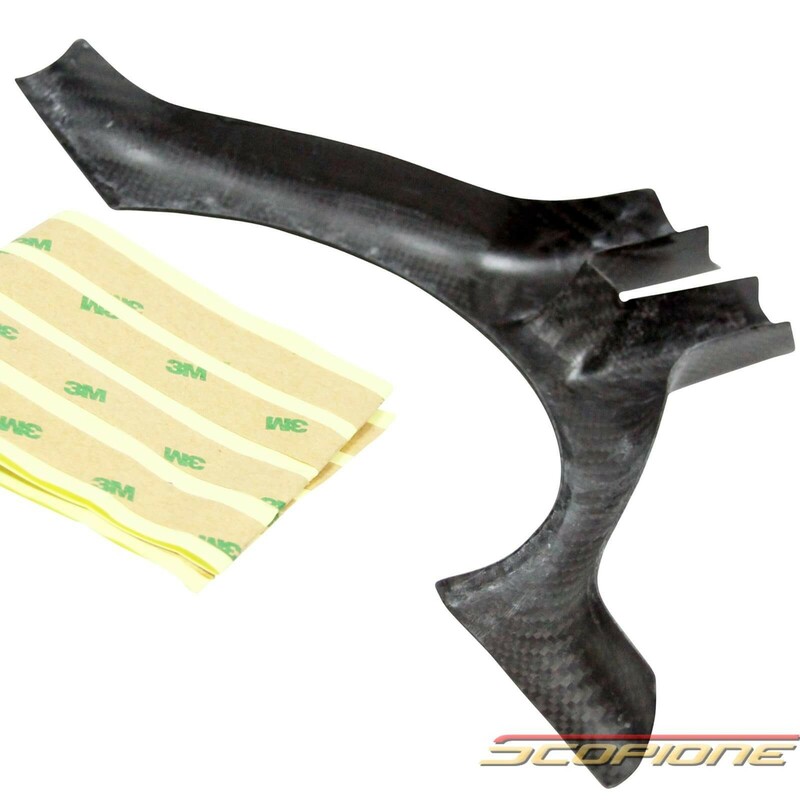 What is the difference between wet and dry carbon fiber? What are the pros and cons between dry carbon and wet carbon parts? What kind of carbon does Scopione use to make their parts and products? What is a carbon fiber weave? What is the difference between “1x1” and 2x2” weaves? What types of finishes are available? 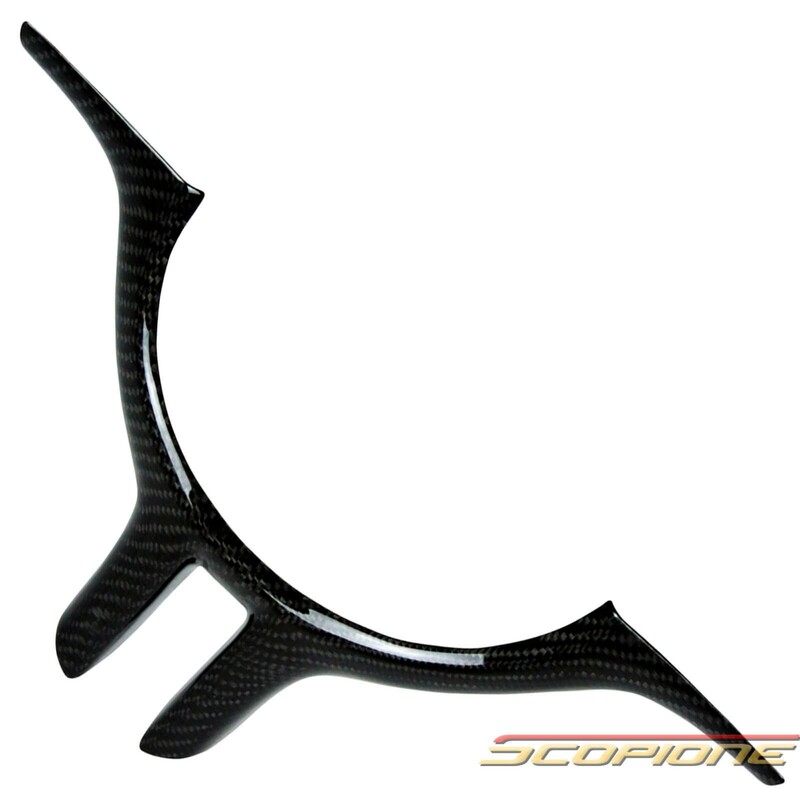 Will I find irregularities or broken patterns from Scopione carbon fiber parts? How do I maintain my carbon fiber products? Yes, we are able to create most of the parts in carbon fiber. A customized job requires a special order with a minimum of 20 items. If you are interested in having customized carbon fiber parts, please contact us directly. Do you sponsor? If so, how to I qualify? We are happy to review your qualifications further at that time. All of our products are sold on the “as is” basis. We offer a six to twelve month limited clear coat warranty. Also, we test fit all parts before we make them available to the general public for sale. However, we want to make clear that no aftermarket body parts will fit exactly like OEM. This is normal and customers are expected to make the minor adjustments so that they fit well. Having said that, we are highly confident that our products that we sell are among the best in terms of fitting in the aero-styling market and our warranty extends only to vehicles that have not had any previous bodywork. As a precaution, we ask you to test fit all parts before you cut/paint/drill them. Absolutely! Our central warehouse is located in New York City, so if you are in the area, we would love to see you! Please contact us and set up an appointment for local pickup. We keep you informed of your order through the email. Once shipped, we send you a tracking number that will keep you aware of where your order is at. Plus, you may also check your Order Status page for any updates. Generally speaking, for all items that are in-stock it takes two to three business days to ship it. Once the order ships, it generally takes three to five business days for you to receive the shipment if you live in the contiguous 48 states of the US. International shipments take from three to fifteen business days after the initial processing time to arrive. The carrier of your order will depend on which of the warehouses your item(s) will ship from. Yes we do! Please contact us for our international shipping rates. If the product was defective inside the box, we will gladly exchange it for a new one. While we do not cover or reimburse the shipping costs, we will ship the replacement item to you at our expense. We examine and double-pack each and every item before we ship. We record all information before shipping and do not send out any item that has been damaged. Therefore, any item that arrives to your residence in a damaged state means that it was damaged in shipping. We understand that due to the size of many of the items that we sell, handling them can be somewhat awkward and there are times when the trucking staff does not handle them carefully enough. We must count on the consignee to examine the condition of the product upon receipt. If you notated all damages on the delivery receipt, then you can file a claim with the trucking company. You can also contact your dealer to obtain supporting documents from us, if required by the trucking company. Carbon fiber is a material that is created from thousands of individual fibers of carbon that are bundled together and woven into a cloth. When this cloth is combined with a resin epoxy, it becomes a very strong, yet lightweight material that is ten times stronger than steel. In the automotive world, carbon fiber is used to enhance the performance and cosmetic appearance of vehicles. What is “Grade A” carbon? Although there is no official standard that grades carbon fiber products, there are still significant differences in overall quality depending on the manufacturer. In response, the manufacturer began calling their products “Grade A” to help stress their overall quality, but this is really a marketing term and not an official grading of the carbon fiber products themselves. At Scopione, Toray Industry Inc Carbon Fiber material is used in Scopione products. Toray is one of the leading suppliers for all car manufacturer composite materials and has a sterling record for quality. The carbon fiber is a material that is an innovative piece of cloth that is assisted by other elements in order to help keep its shape. Items that are listed as either “Dry Carbon Fiber” or Pre-Preg Carbon Fiber” are made only from carbon fiber materials. If an item is “CFRP” or Carbon Fiber Reinforced Plastics, then it uses carbon fiber as the primary reinforcement within a plymer matrix and may be combined with fiberglass backing to help construct the skeleton of the part. Is it a gel-coat or clear coat finish? Is the carbon sheet wrapped around the skeleton or is it integrated into the mold? All Scopione products are made using the one-piece carbon sheet that has no broken lines or patterns. Plus, we use a clear coat finish which is shiny and highly durable, giving a “wet” appearance to the vehicle unlike the duller gel-coat finishes. Finally, all of the carbon sheets are built into the mold itself so that they do not break or split apart like the ones that only wrap around the skeleton. Lightweight: This helps create better speed, acceleration and fuel economy. In addition to these advantages, carbon fiber parts offer a pleasing, eye-catching aesthetic quality that enhances the appearance of vehicles. The difference lies in the way they are manufactured. Dry carbon fiber is crafted with pre-preg or impregnated resin fibers that are already in the carbon itself. Wet carbon fiber is hand coated with resin before the product is actually finished. The differences between dry and wet carbon are based in how each product is manufactured. There are extensive articles that detail these differences that you can find when doing a general search. As for the pros and cons, here is a basic breakdown of what each type of product is best at. Dry carbon is best for “race usage” as you get the most strength and save the most amount of weight. This is because the weaves and quality are more consistent through the part itself. The downside is that dry carbon fiber parts are usually three to four times more expensive than their wet counterparts. Wet carbon items are hand-laid or vacuum infused which means they are more prone to small defects such as wavy weaves and tiny bubbles which compromise the material. Also, they are heavier than their dry carbon fiber counterparts. However, they have a very pleasing aesthetic quality, they do reduce the weight of the vehicle and they are significantly less expensive than dry carbon fiber. Given the popularity of wet carbon products, they are often referred to simply as “carbon fiber”. 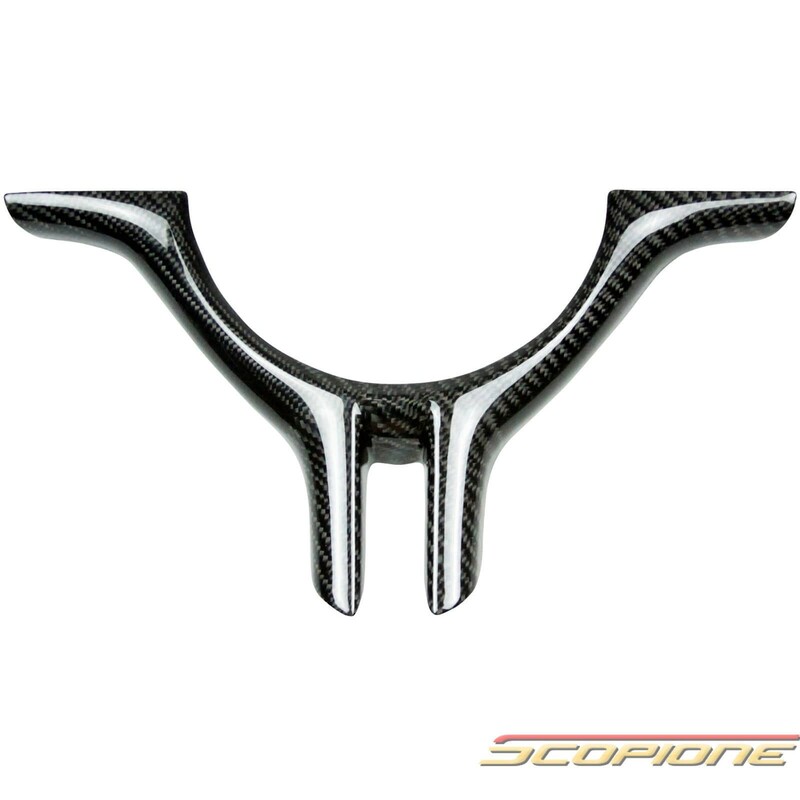 Scopione uses both wet and dry carbon fiber. Dry carbon fiber is stronger and lighter than wet carbon fiber. The weave is the pattern formed when the carbon fiber is made into a fabric. There are many different kinds of carbon fiber available and they are usually identified by the size. The difference lies in the pattern of the weave itself. 1x1 weaves look like a square pattern while 2x2 weaves look like diagonal lines. There are several types of finishes available and can be tailored to suit your needs. Plus, all carbon fiber products have UV-resistant protection to ensure a high quality finish and to protect against fading from being exposed to sunlight and the elements. All parts and products from Scopione are created from a continuous single sheet of carbon fiber than insures you do not get any irregularities or broken patterns. Keeping your carbon fiber products clean and out of the sun as much as practical will extend the new, fresh appearance that they have. I cannot find the answer to my question, so now what do I do? If you didn’t see your answer here, then please contact us directly or call one of our friendly, courteous representatives on our customer service line at 1.800-820-6346 Mondays through Fridays from 10am to 7pm EST. - Please send PayPal payments to our verified account. - PayPal registration is free and easy. It is the preferred method of payment that accepts Visa, MasterCard, Discover, American Express and E-Checks. - If you wish to pay through other methods, please e-mail us for more information. - Payments must be received within 7 days of purchase. Company and personal checks must clear before shipment. Allow 6 days for clearance. Only for New York State Residents: Add 8.875% Tax. Local Pickups are available with appointment only. Please call us to set up your appointment today. All products sold by ScopioneUSA are sold AS IS to the customer. If the manufacturer offers warranty, warranty documentation will be sent with the product. All products sold are intended for showcase and legal use only. Scopione and ScopioneUSA are not liable for any damages or injury as a result of these products. Scopione and ScopioneUSA will not be responsible for the customer's actions. By complying with our policies, the customer understands the procedure and possible difficulty in assembling the product. We HIGHLY recommend that an experienced, professional technician performs the installation. Refunds will not be issued due to poor fitment. Please check each product's additional information to see the length of the warranty. All warranties start from the date of the purchase + 7 days. To view the various shipping rates for your item, check the item listing. If Standard Flat Rate Shipping Service is selected, your package will usually go out via UPS ground or USPS Priority. Please note: depending on your geographic location, not all methods are available. You will be notified of all shipping and handling charges during checkout and before your order finalizes. Upon completion of the checkout process, an Order Confirmation will be emailed to you. Items that are in stock will be shipped out within 48-72 business hours via UPS, DHL, USPS, FedEx or other carrier. Ground service will be used for shipping, unless otherwise specified. UPS Ground Service normally takes 1-7 business days from the time your order is shipped. We also ship to P.O. Boxes and A.P.O addresses by USPS mail. For international orders we use DHL Express, UPS Express, or USPS Priority and Express - whichever is cheaper to ship to a given country. Note: The shipping rates for Canadian Buyers may be slightly higher than for US Buyers. Please email us for shipping rates. Shipping and Handling fees are non-refundable. The buyer is responsible for shipping and handling charges, as well as any charges incurred by the carriers. The buyer is also responsible for all re-delivery charges that occur if the buyer misses scheduled delivery appointment. All international customers are responsible for their own customs clearance, duties, taxes, brokerage, etc. We will not be responsible for any international customs clearance, duties, taxes, brokerage, etc. Some trucking companies may require brokerage services. We are not responsible for any brokerage services whatsoever. All orders will be shipped via the most economical method chosen by Scopione-Dealer team. Our central offices are located in New York City. Depending on the item, orders are filled by either our central Brooklyn warehouse or one of our off-site fulfillment centers, located throughout the United States. If you require more information regarding shipment origin before placing your order, please don’t hesitate to contact us. All returned merchandise must be in its original condition, original factory box, and packaging. We will NOT process the return if these conditions are not met. We highly recommend sending returns to ScopioneUSA with tracking confirmation and insurance. We are not responsible for returned merchandise that is lost or damaged during transit. If you’re not satisfied with your order and wish to return it, you may do so for an exchange or store credit (in the form of a gift card). It is our policy not to give refunds, but we will be happy to work with you in order to ensure your satisfaction. Please contact us by email with your purchase information, or speak to one of our trained representatives at 800.820.6346 about any issues that may arise. We'll do whatever it takes to ensure that you are happy with your order and continue to be a valued customer. Feel free to contact us if you have any questions about our return policy. The cost to return an item to our store is comparable to the cost of driving to a brick-and-mortar store to return an item—it’s not reimbursable. Therefore, we do not cover return shipping cost for any reason. If an item you received is defective, we will happily replace the item with a new one; however we do not cover or reimburse the shipping cost for returning defective merchandise back to our store. We will ensure that your replacement product is free of defects and process it back to you quickly. When your order is fulfilled, items will be subject to restocking fees. Speak to a Scopione Specialist over the phone today. Privileged to be your custom car accessories & auto parts supplier. Offering aftermarket modifications, specializing in carbon fiber (fibre) mods. For cars such as BMW, Ferrari, Lamborghini, Porsche, Lotus, Rang Rover. Our shop offers trunk spoilers, front grilles, bumpers lips, side mirrors & more.